Hi friends! Today we celebrated our gorgeous eldest daughter’s 7th birthday here in Mirissa, Sri Lanka. We knew that it would be a slightly unorthodox birthday, what with being nearly 6000 miles from the UK and all. The last family birthday we celebrated was Eira’s 5th, the evening of which we hopped in a taxi to Gatwick to start our full time family travel adventure. 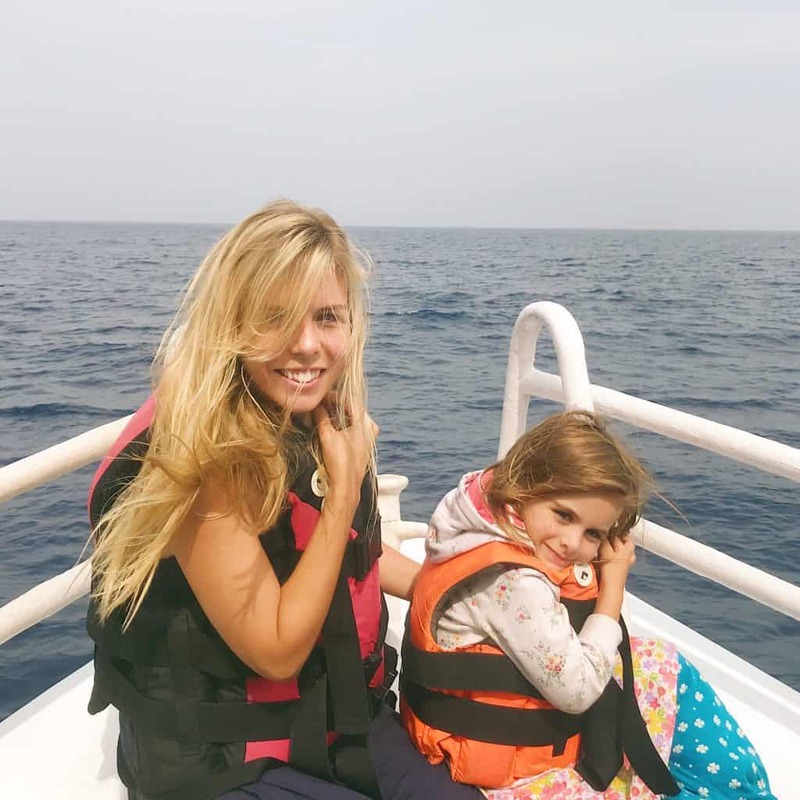 We asked Esmae how she would like to celebrate and she asked to go on one of the whale watching trips that Mirissa in Sri Lanka is famous for- she particularly wanted to see dolphins. Ironic travel journalist confession time: boats and I do not get on. I can’t think of one time when I’ve got on a boat and not regretted it, but of course I wasn’t going to miss this for the world. Sri Lanka seems to have pretty, ahem, lax guidelines when it comes to drugs and I’d heard that the boat staff dole out sea-sickness tablets like Tic Tacs, so with that vague safety net in mind we took the plunge. 1 Whale watching Sri Lanka: What does it cost? 2.1 Whale watching Sri Lanka: What did we see? 2.2 Would we recommend whale watching Sri Lanka? 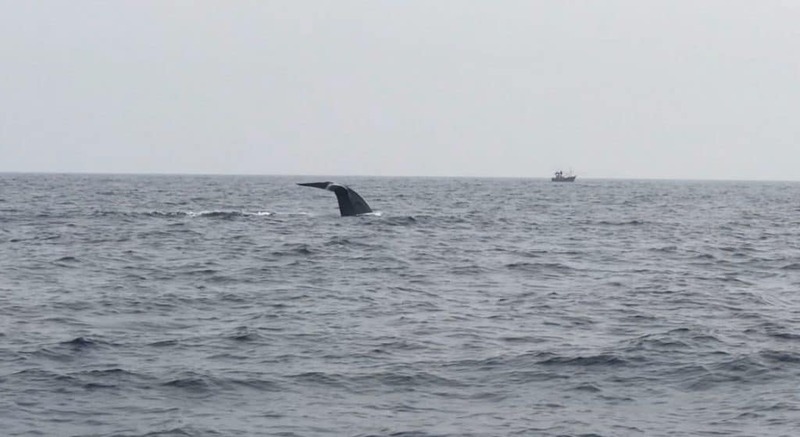 Whale watching Sri Lanka: What does it cost? 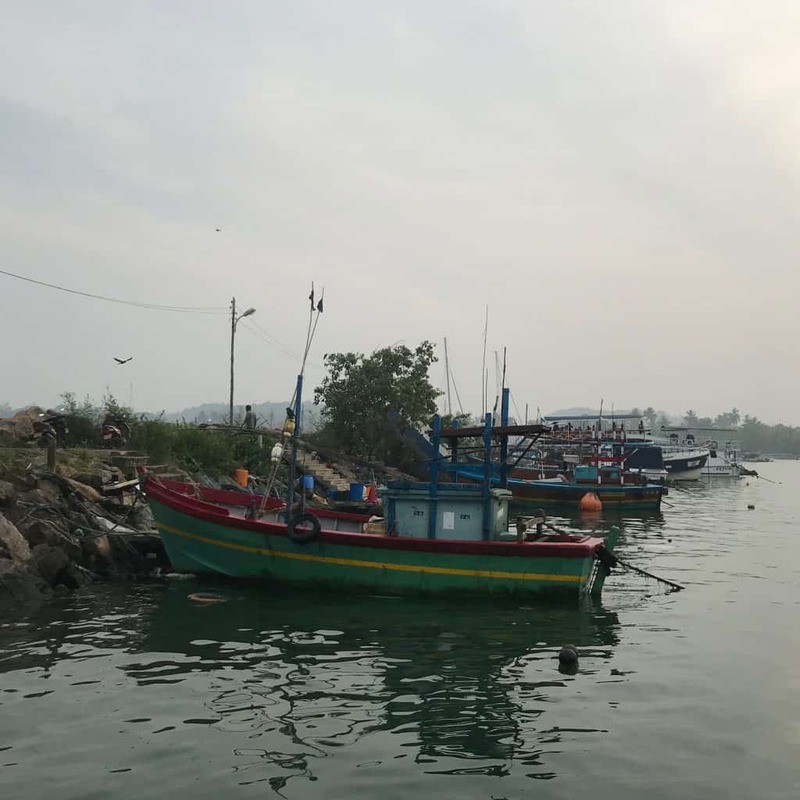 A tuk-tuk arrived for us at 6.30am- we stumbled in a tad bleary-eyed and were driven the ten-minute ride to the rocky man-made harbour, taking in the sea air perfumed with Eau de Fish. 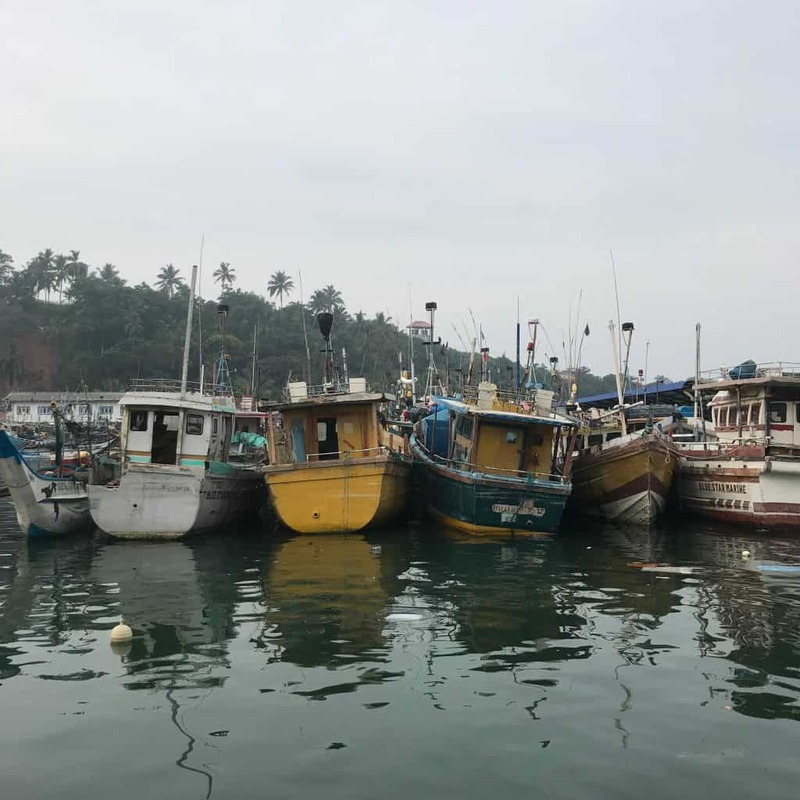 We bought our tickets from a small stand at the harbour and boarded the boat with the help of local guys- Sri Lankan boats take ‘Mind the Gap’ to a whole new level, it may as well be ‘pole-vault halfway across the ocean’ to get onto the things. Eira’s ‘early morning’ face, Daddy, and the birthday girl! We donned life jackets and after a brief shuffle during which we were advised to swap to a less-full boat (and did), we set off. Cheese sandwiches and chocolate cake, the natural choice for any breakfast, was brought around as well as tea, coffee and fresh pineapple. Most tours offer this free on the boat as breakfast as the journey starts so early. It was a cloudy morning, perfect for being out on a boat as it was nice and cool. We spotted fishermen far, far out to sea who had rowed all the way out there- it was almost unbelievable, these guys must have shoulders of steel. Whale watching Sri Lanka: What did we see? About half an hour into the ride the engine shut off and we headed to the front of the boat to see what they’d found. Our first wild turtles! 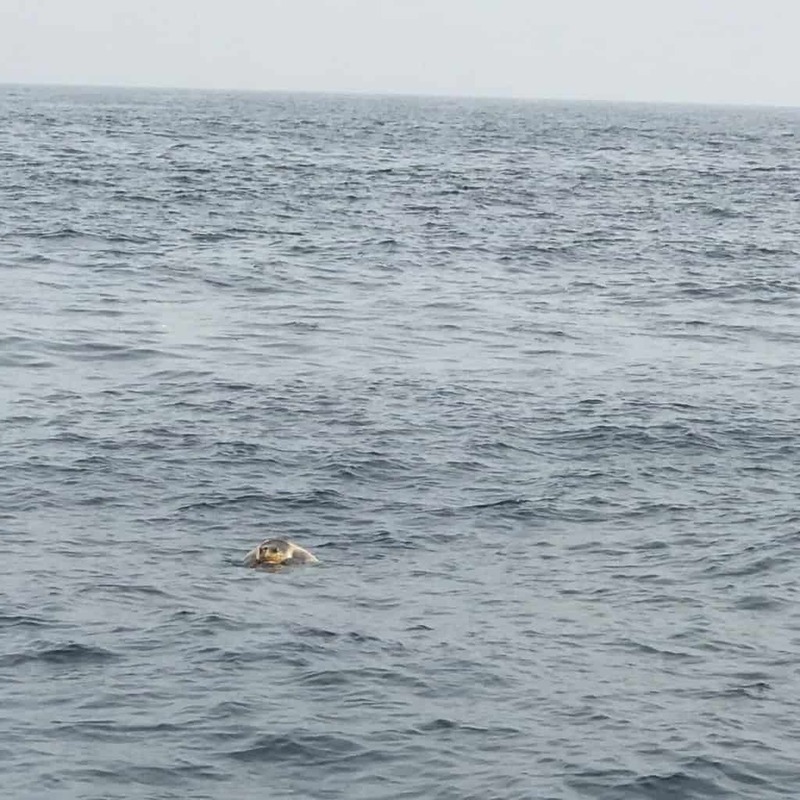 I was particularly thrilled as I’d been wanting to see turtles in the wild for ages, so this was a great bonus on our Sri Lanka whale watching trip. The only thing was that the poor turtles were, erm… busy. Making babies. I did feel a bit bad taking photos, but now you know what mating turtles look like. You’re welcome. Another fifteen minutes or so and the first pod of dolphins appeared (on the tours you have around a 50% chance of seeing dolphins). Tens of them, if not a hundred, jumping and swimming around the boat, some of them hopping up to balance on their tails. Esmae was thrilled- dolphins were the animal she wanted to see the most, and some of them played right up next to the boat and in front of it. (They are super hard to photograph as they move so quickly, so I’ve grabbed a screenshot from the video I took). One of the guys on the boat thought that he could attract the dolphins closer by throwing crumbs of his cheese sandwich into the water, which is possibly one of the funniest things I’ve seen in Sri Lanka (surprise, it didn’t work! Should’ve tried Marmite). 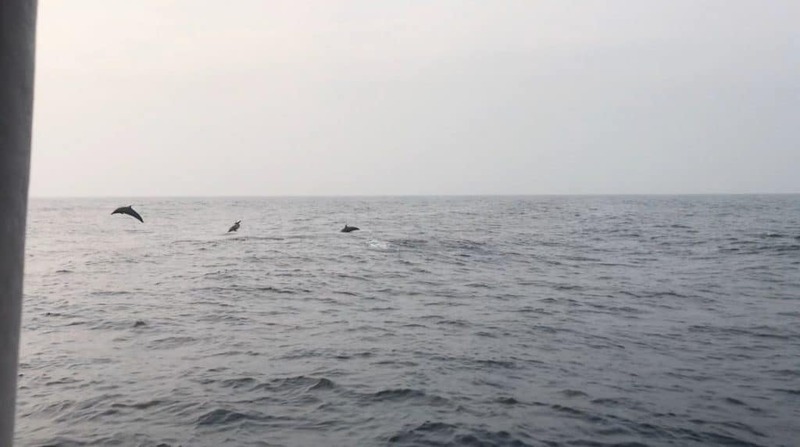 As the dolphins headed off, Esmae was overcome with the rocking motion of the boat combined with a super early start, and threw up over the side. The staff were handing sea-sickness pills out to the adults, but I didn’t feel comfortable giving them to her as I didn’t know what they were, and I’d heard that they act like a super sleeping pill. Patrick went up to the top deck at one point to check out the view and came back to report that every one of the group of Japanese tourists who had taken the pills were strewn on the floor and over the seats, pretty much comatose. One of the boat staff, who was very kind to the girls throughout the trip, appeared with a bottle of peppermint oil and proceeded to rub it into Esmae’s temples and give her a little head massage, which really helped. I don’t know much about oils but inhaling it definitely helped her and I with the nausea, so if you have little ones or you are prone to sea-sickness I would recommend looking into getting some before you go! 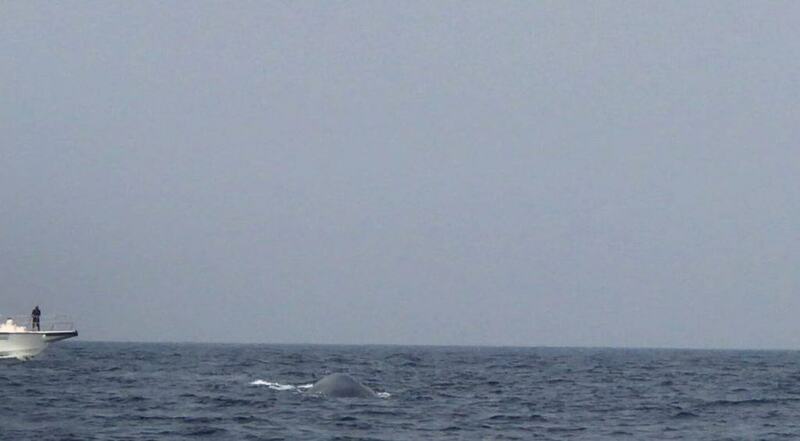 It was around an hour or so after the dolphins swam off that we spotted our first whale- a humpback. I was thrilled to see the classic ‘tail’ splash; it was an amazing moment seeing such a huge creature in the wild, just doing its thing. I got a pang of sadness as we were out there, wondering how much longer these amazing animals will be around for- if we keep using plastic at the current rate, worldwide by 2050 there will be more plastic in the ocean than fish. It really struck me that unless we all make changes, we could be one of the last generations to see wild whales. 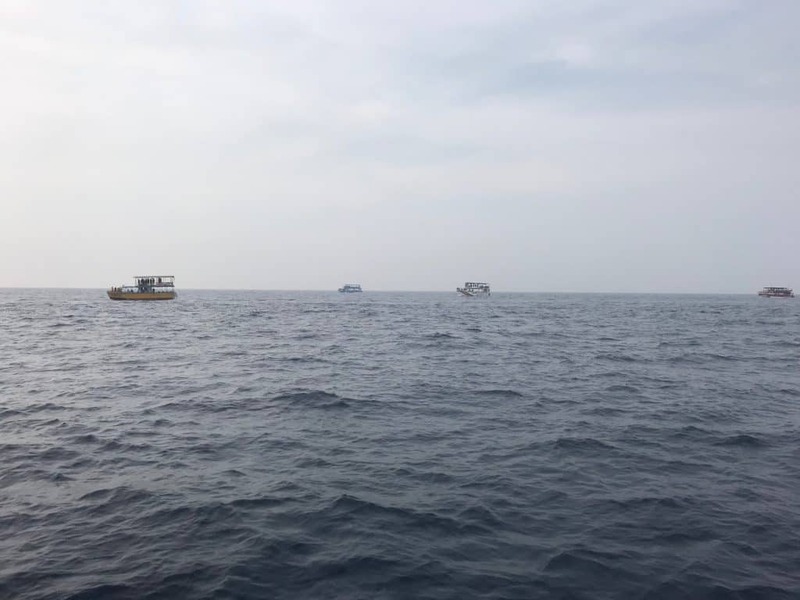 The humpback disappeared fairly quickly, and to be honest I was pleased as not all of the boats were sensible and one in particular seemed to disregard the noise it was making and how closer it was getting to the creatures we saw. I’ve heard from various people that there are some tours who are very good about it and some who are careless; thankfully the sensible ones do call the coastguard if there is any tomfoolery, and sure enough the coastguard boat appeared fairly swiftly. 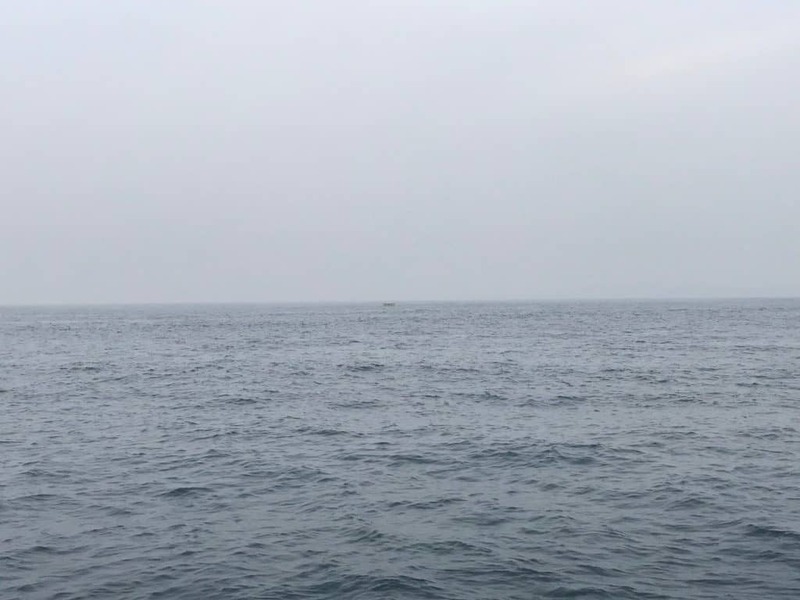 Our boat continued on towards the horizon (it is weird looking around you for 360 degrees and seeing nothing but ocean) and finally we spotted the big one- a lone Blue Whale. Sri Lankan Blue Whales are apparently the only group who don’t migrate, which is why this area is known for the whale watching tours. We saw it spray up through its blowhole a few times and got a look at its huge back as it dipped up and down beneath the surface of the sea. We didn’t see its tail, which is the only thing that would have topped it off, but it was an incredible moment and the kids were ecstatic. The Blue Whale is generally the last thing you’ll see on the tours and after that it is time to head back. The staff brought around a tip jar (if you do tours in Sri Lanka please tip; it is a very poor country and tips make a big difference to the staff). It took around an hour to get back to the harbour and another tuk-tuk was waiting for us to take us back to the guesthouse. Our tour was five hours door to door, which we were pleasantly surprised with as we had expected it to take longer. When you head to Mirissa you will see countless tours advertised. 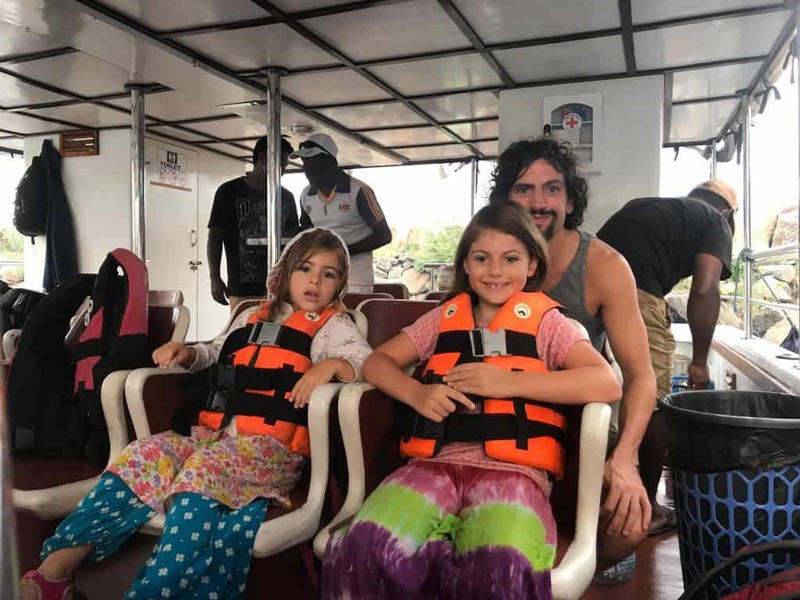 The one that we have heard consistently good things about are Raja and the Whale, but we booked with Atlantis tours and were very happy with the whole service. 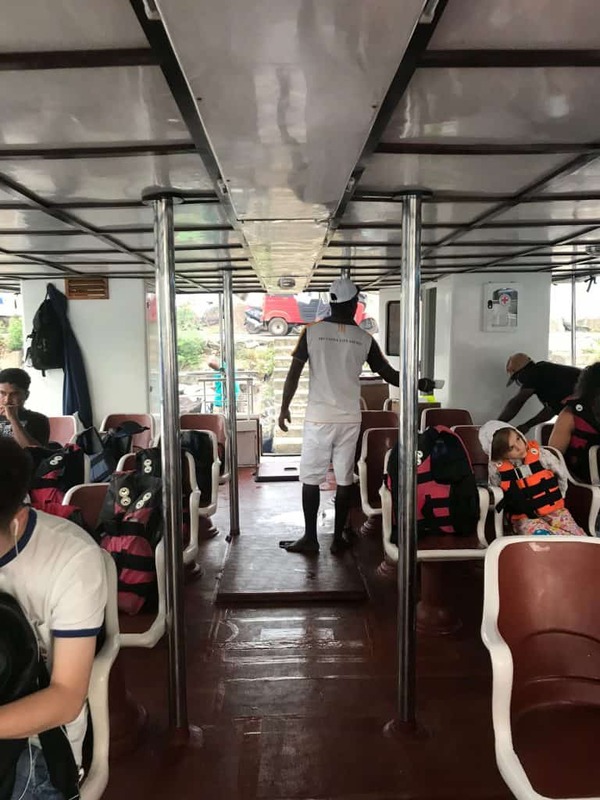 The staff especially were very kind and proactive with everyone, making sure that the passengers knew as soon as they spotted animals and telling them the best spots on the boat to see them. They went out of their way to make the kids comfortable, making them pillows out of life jackets, giving them extra juice and generally being really lovely. Would we recommend whale watching Sri Lanka? 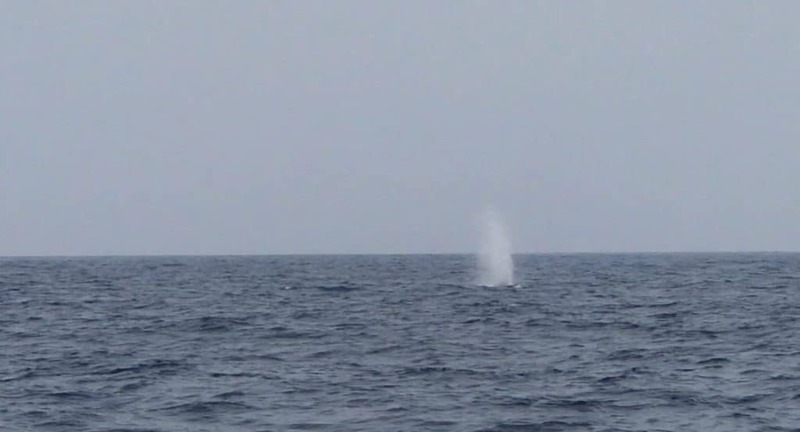 I would highly recommend booking whale watching Sri Lanka. The nature and wildlife of Sri Lanka is one of, if not the best things about the island and it was a very special day that we will remember forever. Check out more of our adventures in Bali or Thailand, or Sri Lanka, subscribe to our YouTube channel for videos and follow us on Instagram and Facebook for daily insight into full time travel life! Waw! What a great day you had. Lov to Read this at 06:00 GMT before i get up for work. I can hear The dawn chorus OUTSIDE as light is breaking. Good call on avoiding the travel tablets. Belated BIRTHDAY ? greetings Esmae. Wow. WOw, Babe! Birthdays, huh? I can’t wait for Elfie’s-you’ve set quite a bar, there! It’s gonna have to be Unicorn watching! !